While the social media photo sharing platform Instagram is an amazing way to share your wedding with the world, smartphone pictures may turn out blurry, dark, or unflattering if you haven’t mastered your phone’s functionality. 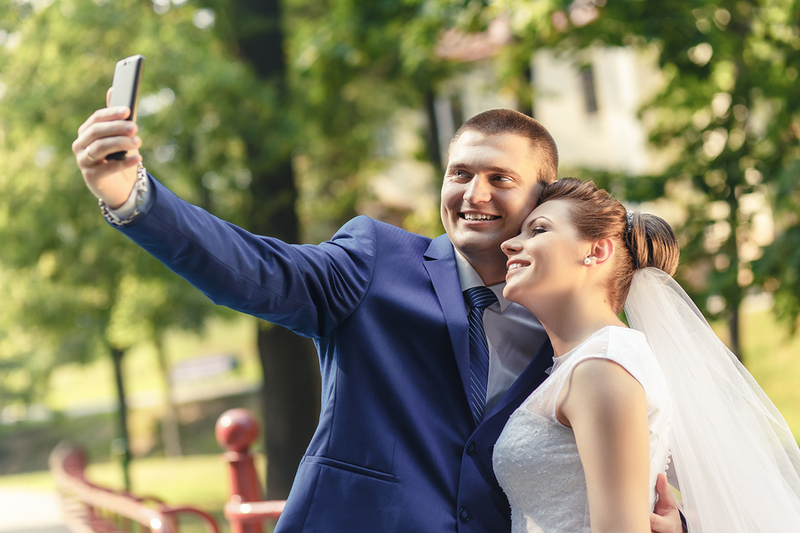 To make sure your bridal photos accurately depict the beauty of your wedding day, Hollywood Banquet Hall’s social media experts have put together a list of tips for taking awesome Instagram wedding photos! While you can take photos using the Instagram App – it uses the same camera as your phone’s native camera app, after all – the Instagram App limits your hardware’s functionality; you can’t zoom while using the Instagram app, for example, and all of your photos are immediately cropped into a square. Instead, take wedding photos using your device’s photo app, and select them from your photo folder once you open Instagram. Smartphone cameras are getting more advanced with each new evolution, but most still can’t capture a clear image if the camera is moving too much. To make sure all your photos are crisp, steady the shot by drawing your elbows in close to your body or leaning against a sturdy object, like a tree or a table. Because your camera will automatically slow the shutter speed to take in more light in dark rooms or at night, this is especially important for low-light photos. While Instagram’s square framing (which emulates the old Polaroid-style photos) may be reminiscent of a nostalgia-inducing era, working within these symmetrical limitations means you must give objects ample room of all sides when taking a shot, lest they be cropped when the image is squeezed into the square shape. Try taking a couple steps back when snapping a picture, or, if using iOS 7, swiping right in the iPhones’s camera app to shoot photos with a square frame. Your smartphone’s “Tap to Focus” feature is an especially useful took if you’re trying to focus on just one subject among many – the bride on the dancefloor, for instance, or the wedding cake in a romantically-lit banquet hall. Just before taking the photo, simply tap your finger on the subject you want the camera to focus on, and watch your Android or iPhone’s intuitive technology work its magic! Anyone perusing through the thousands (millions?) of Instagram photos posted each day may be convinced that every girl has flawless skin and every photo is taken in perfect lighting, but the truth is that most Instagram gurus use a number of filters to achieve a radiant, “natural” look. And while the Instagram App has a variety of ways to modify your picture, we recommend using one or more of the following “post-production” apps to achieve Insta-perfection! VSCO Cam. A great app for color correction, this minimalist iOS and Android app makes it easy to create artsy, edgy photos that will make your audience say, “Wow! How did she DO that?” Cost: $Free. Camera+. This easy-to-use App offers filters, exposure settings, and focus-modification beyond Instagram’s basic functionality; in seconds, you can make almost any photo look better with Camera+. Cost: $1.99. Diptic. Perfect for creating professional-looking collages, Diptic is often used for displaying multiple pictures of wedding decorations, food, or bridal accessories. Cost: $.99. TouchRetouch. An easy-to-use “Photoshop-on-the-go,” TouchRetouch allows you to remove unwanted flyaways, distracting objects, even unwanted wedding guests from your photos. Cost: $1.99.